Gizmodo.com has a great FAQ that pretty much covers all the questions you might have about the 3G iPhone. We'd spell it all out here, but we gave our proof-readers the day off to plant trees for Arbor Day, so for the time being you'll have to read what we would normally print here at the original source. One interesting tid-bit we feel compelled to reprint (without proof-reading) is that there is growing speculation that the 3G iPhone might still have a front-facing camera. Or, that Phil Schiller used a prototype iPhone which had a front camera during his WWDC demonstration. The jury is out, and you're on it. Time to vote. Big Steve will announce the 3G iPhone and possibly some new products. The only new iPhone rumor we've heard in the last few days suggests the 3G iPhone might have a better camera with a high-tech liquid lens which uses the process of "electrowetting" for faster focus and faster exposure. We suppose it's possible, but it seems unlikely. Since there aren't any other iPhone rumors, we thought we'd point out a couple of interesting tid-bits that are based, not on rumors, but actual photographic evidence. As is the case with every Apple event, some industrious tourist managed to snap a blurry photo of the banners already in place at the doors of the mighty shrine where Monday's big announcement will occur. 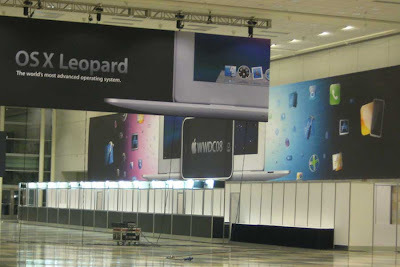 At first glance, the picture is rather innocuous... Apple products and software icons plastered on giant posters. 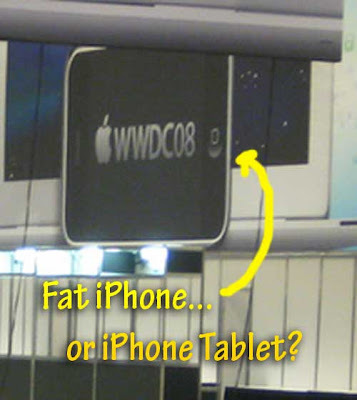 If you've ever been to a convention, you know this kind of signage is commonplace... but, if you look closer, you'll notice the proportions of the products shown in the signage are way off... which can mean only 2 things: The printer made a mistake (in which case Apple is due for a refund) or, the proportions are correct, and the banners are actually showing us new products that have different proportions than the products they appear to resemble. On the off chance you checked out the the snapshot above and missed the obvious, the iPhonePOV art department spent the day creating original artwork which details the discrepancies. 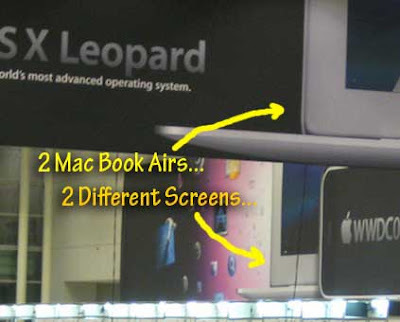 1) The are 2 Macbook Airs shown on separate banners. The screen bezels are noticeably different. The screen in the background has a large bezel at the bottom... we think this might be a new Macbook Air with a 14 inch screen. Thin and big. Hmmm. 3) The normal (non-fat) iPhone at the right of the photo is holding hands with an icon we've never seen. Perhaps this is the GPS icon... or maybe it's something so cool we can't even guess. That should be enought to chew on for the weekend. If you see anything we've missed, please let us know.